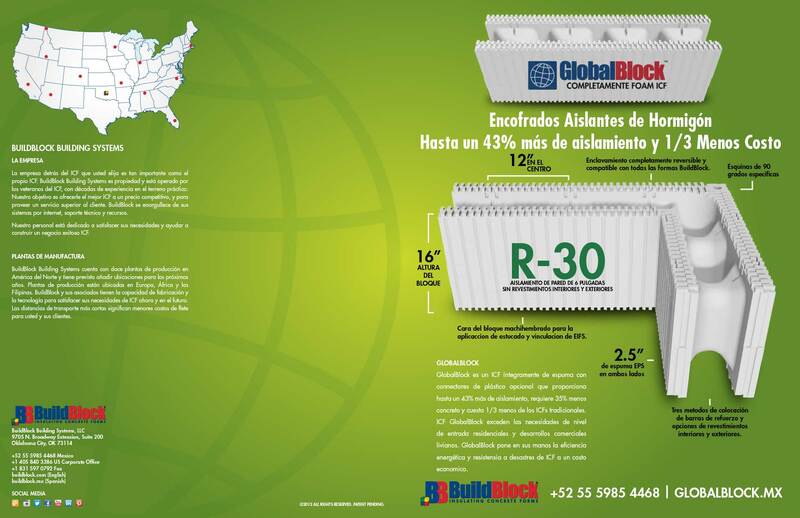 GlobalBlock – a web optional all-foam ICF GlobalBlock is the first fully-reversible all foam ICF block of its kind. An evolution of the screen-grid ICF, it integrates seamlessly with any BuildBlock form allowing you to save time, effort, and money. GlobalBlock is a lower-cost ICF, designed without requiring an integrated plastic web. It reduces cost without losing the benefits of ICFs or affecting key structural points. application of EFIS or stucco coating such as BuildCrete Plaster or Stucco. An optional web insert for attachment points or web clip for rebar placement are available depending on your needs. Using the same fully-reversible interlocking system found on all BuildBlock forms, GlobalBlock has the same overall dimensions allowing the forms to be used interchangeably, even within the same wall. GlobalBlock also includes benefits such as the molded-in tape measure and vertical cut lines making installation easier, faster, and more cost effective. GlobalBlock is available in 4-inch and 6-inch core widths. 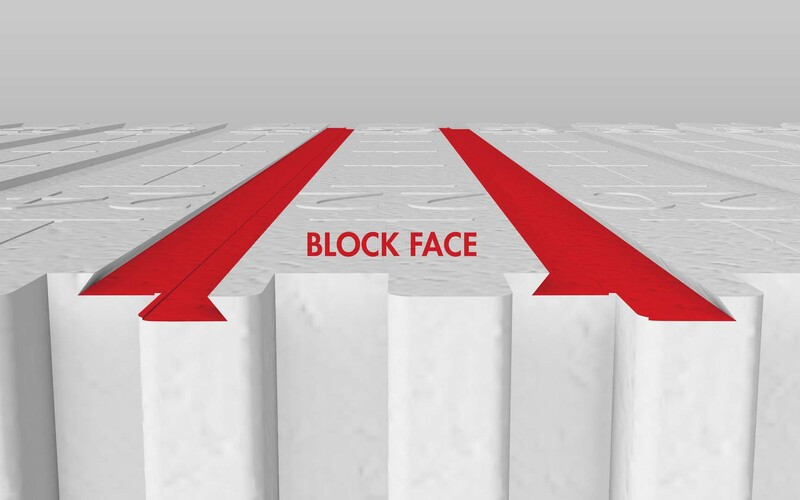 Designed to be a more cost effective product for both domestic and international markets, GlobalBlock increases insulation value, decreases concrete and provides exceptional strength and support. The 12-inch on center design was chosen for its strength and reslience in the field. Attachment points using the optional web insert will align with BuildBlock forms and provide for easy drywall installation, brick ties, or other finish. The dovetail on the face of the block provides a secure surface to apply EFIS, Stucco or Plaster. BuildBlock recommends using BuildCrete Stucco or BuildCrete Plaster to finish your walls giving you extreme impact resistance and the ability to apply the covering in one coat directly to the foam. 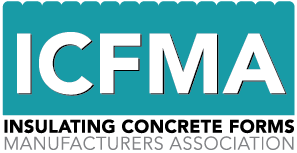 Learn more about BuildCrete here. 16-in (406.1 mm) x 48-in (1219.2 mm) industry standard size. Up to 43% greater R-Value depending on block size. Designed for entry-level residential, international, and light commercial projects. Ready to stack, no assembly required. Symmetrical design and completely reversible in all directions. 3 methods of rebar placement: Optional web insert with attachment points, cut rebar pins, and steel rebar saddles. Interlocks & fully integrates with all BuildBlock forms for specialty blocks and lintels. 1-inch (25.4 mm) repeating cut pattern & molded-in tape measure for easy cutting and sizing. Dovetailed block face for direct stucco and EIFS bonding. 4-inch (101.6 mm) & 6-inch (152.4 mm) sizes with dedicated 90° corners. 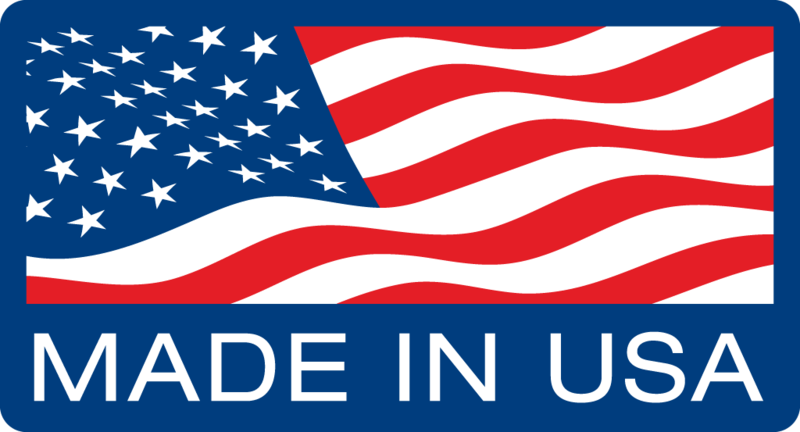 Please note GlobalBlock is only currently available in 4″ & 6″ sizes. GlobalBlock integrates fully will all BuildBlock products. Please note GlobalBlock is only currently available in 4″ & 6″ sizes. GlobalBlock integrates fully will all BuildBlock products. 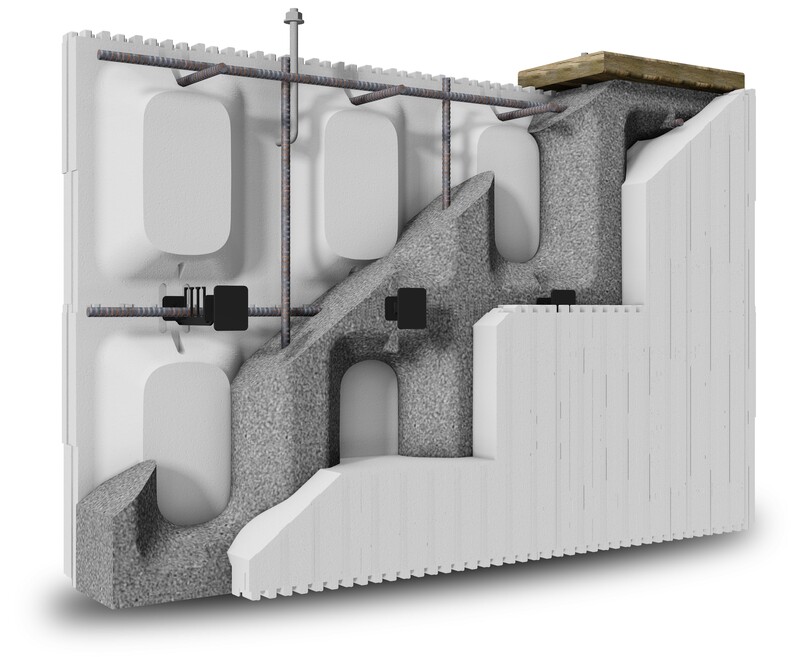 GlobalBlock is a revolutionary new Insulating Concrete Form (ICF). It is a web-optional design, allowing for much more flexibility in design, and additional cost savings. An evolution of the screen grid design, it seamlessly integrates with other BuildBlock forms to offer a more cost effective ICF solution, while still allowing the use of BuildBlock flat-wall forms in bond beams, lintels, pilasters, safe room walls and other critical areas. GlobalBlock es un nuevo y revolucionario encofrado de concreto aislado (ICF). A diferencia de otras marcas, es un diseño que permite utilizar membranas plásticas dando mucha más flexibilidad en diseño y ahorros adicionales. Siendo una evolución del diseño ICF estilo parrilla, se integra perfectamente con otros bloques de BuildBlock para ofrecer una solución de ICF más rentable, ya que permite el uso de bloques BuildBlock tipo pared plana en vigas integrantes, dalas, pilastras, paredes de cuartos de seguridad y otras áreas que requieran este tipo de ICF. Installation of GlobalBlock is similar to installing flat wall BuildBlock forms. Begin by stacking block from each corner. Remember to reverse corners each course to ensure the proper offset. GlobalBlock cores are designed on 12-inch centers. All other BuildBlock ICFs are designed on 6-inch centers. Keep this in mind when laying out the walls and rebar pins. GlobalBlock connections align with BuildBlock forms to create a seamless transition between different products. BuildBlock recommends 3000psi concrete poured at a 5 to 5-1/2 inch (127mm-140mm) slump. Note: As concrete is being pumped under pressure, it loses approximately 1/2-inch of slump. Pour the wall in 4-foot lifts (1219mm) working your way around the structure several times until you reach the full wall height. Vibrate wall shortly after pour to ensure no voids. GB600 is designed to meet the IRC 2009 & IRC 2012 prescriptive code.